The Buddha Sasana Foundation of America/Canada (BSF), is a US-incorporated tax-exempt non-profit 501(c)(3) co-founded in 1984 by Alan Clements and Ingrid Jordt (with Jeannine Davies as Vice-President). The BSF has organized periodic retreats in the tradition of Mahasi Sayadaw and sponsored Burmese Buddhist monks to teach insight (satipatthana vipassana) meditation in the United States. Our core members are involved in identifying the historic roots and core principles of the dhamma teachings coming out of the Burmese Mahasi tradition in order to translate these practices to a new generation of (especially) lay practitioners in the West. Alan Clements, a former Buddhist monk at the Mahasi Sasana Yeiktha, is the author of a number of books including, Instinct for Freedom and A Future To Believe In. He is also an international dharma guide and inspirational speaker who has dedicated his life to manifesting a principled Buddhist approach to social justice issues, environmental sustainability and compassionate service. Ingrid Jordt is the author of Burma’s Mass Lay Meditation Movement, (2007) an account of how insight meditation was systematized and bureaucratized for the lay masses and implemented as a nation-state building project after Burma’s independence from the British in 1948. She is a frequent media commentator on Buddhism and politics in Myanmar/Burma. She teaches at the University of Wisconsin, Milwaukee. Jeannine Davies is co-author of Post-Traumatic Stress Disorder (2012) and focuses on mindfulness-based interpersonal therapies. Her research has involved the intersection of Burmese Buddhism, human rights and non-violence, consciousness and Western Psychology with an emphasis on distilling the core inner energies and expressions that catalyze personal and social transformation. She is a researcher and psychotherapist in private practice in Vancouver, Canada, and has held teaching appointments in the School of Clinical Psychology at Saybrook University, San Francisco, where she co-developed and co-directed the Complex Trauma and Healing Processes Certificate Program. The Buddha Sasana Nuggaha Organization of Myanmar (BSNO) is the governing body overseeing the day-to-day functions of the Mahasi Sasana Yeiktha (MSY) Meditation Centre in Yangon, Myanmar. U Tint Soe Lin is the BSNO’s current President. Founded in 1947, and buoyed by state sponsorship under then Prime Minister, U Nu, MSY became the locus for a national effort to train Buddhist monks, nuns and laity in the practice of vipassana insight meditation. MSY also became a scriptural learning (pariyatti) center and location for the national examinations (conferring titles on monks and nuns for their scholarly and practical knowledge of Buddhist doctrine and practice). The 6th Buddhist Council (1954-1956) synthesized a new redaction of the texts in an international effort that relied upon Venerable Mahasi Sayadaw (Principal Preceptor at MSY) as the Chief Questioner. The Center is located on twenty acres of pleasant garden land on Hermitage Road (now Sasana-yeiktha Road), Bahan Township Yangon (off Kaba Aye Pagoda Road). There are over one hundred buildings on the grounds for housing meditation teachers and yogis. There is a dispensary at MSY for treatment of minor aliments. Cases needing special attention can be treated at private clinics, dentists or the State Hospital in Yangon. The cool dry season begins in November and lasts through February. Night temperatures vary between 55-65 degrees F and daytime temperatures are from 70-80 degrees F. The days are clear and sunny. Yogis will need sweaters or small jackets at night and blankets when sleeping. 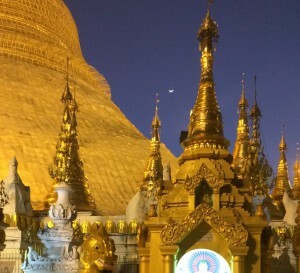 A Myanmar Tourist Visa allows for a 28-day visit and is not renewable. If you overstay your visa (which is allowable for short periods of a month or so), you will be charged $3 per day, which you must pay at the airport before leaving the country. Tourist visas are available at Myanmar Embassies worldwide. See list under links, below. If there is not sufficient time to apply and receive your visas through the mail, a good alternative is to go to Bangkok, Thailand, where yogis can receive their tourist visas often on the same day. Make sure your passport is current and will not expire while you are in Myanmar. Be certain to have multiple passport size photos for your visa application. Yogis must arrive at Mahasi Sasana Yeiktha, 16 Thathana Yeiktha Road, Yangon between 9 & 10 am on the start date of their retreat. The Centre’s Registration Office is the large building on the left as you enter the gates into MSY. Once you arrive bring your belongings into the office and someone will be there to greet you. MSY is about a thirty-minute taxi ride from Yangon Mingaladon International Airport (depending on the time of day). MSY is shown in tourist guide maps and there is a prominent signboard at the junction of Kaba Aye Pagoda and Sasana-Yeiktha Road to guide you. When you arrive at the Yangon airport, cash money inside the airport and take a taxi (about $5-$7 US). If you arrive a day or two before the retreat begins we suggest that you make advance reservations at a hotel, since hotels have been experiencing a massive increase in occupancy since the opening of the country, and rooms are often booked well in advance. In short: bring ‘everything’ you need or want to the retreat, plus extra of each; soap, shampoo, toothpaste, vitamins, towel (s), sandals, thermos, water bottle, yoga mat, sitting cushion (s), meditation bench (if you use one), air cushion for sitting and or pillow (although sleeping pillows are provided), notebook, pens, small flashlight, extra batteries, bedding, blankets, and mosquito net provided, a few clothes pins, washer and laundry soap provided, teas/coffee bags, small plastic containers to store things in (avoid ants), and a few zip lock plastic bags, a few band aids, all items related to personal hygiene, ample supply of medicines if you take them, Advil/Tylenol, mosquito repellent, plastic soap dish, tweezers, small scissors, q-tips, as you can see – make a list of all your needs – bring them. ear plugs, eye shades, sun glasses, hair ties, a global adapter for electrical items. In Myanmar, the local currency is called the kyat. It is used in all market transactions. However, hotels and airlines will not take it as payment from foreigners. Therefore, you must have US dollars or Euros. (Travelers cheques are difficult to exchange. Yet credit cards are becoming widely accepted.) The best exchange rates are obtained with US dollars and Euros. Bring $100 and $50 bills that are as new as possible with no tears or markings. (Torn or worn bills may be refused by money-changers.) You can exchange money at the airport upon arrival as well as at currency exchange counters and banks throughout the city and in most major hotels.